Stems: Erect, stout, mostly solitary, unbranched, glabrous, waxy. Leaves: Mostly opposite, simple, sessile, thick, broadly ovate or elliptic-oblong, 1.5 to 5 inches long, .75 to 3 inches wide, glabrous, waxy, pale green; bases heart-shaped, clasping; margins wavy, usually minutely pubescent; tips blunt, midribs terminating in short, abrupt points. Inflorescences: Umbels, solitary, on stout stalks 1 to 12 inches long, 18-60-flowered, terminal. Flowers: 5-parted, about .75 inch tall, on slender stalks 1 to 1.75 inch long; calyx lobes lanceolate, green to purple-tinged, lanceolate, glabrous; corolla lobes lanceolate, green or greenish purple, glabrous, curved back and downward; hoods erect to slightly spreading, oblong, pinkish to pale flesh-colored; horns incurved, longer than hoods, conspicuously protruding. Fruits: Pods, spindle-shaped, 3.5 to 6 inches long, 1/3 to 2/3 inch wide, mostly glabrous, waxy, usually erect on downward-curved stalks; seeds egg-shaped, tufted with white or tan hairs at tips. Habitat: Prairies, roadsides, and open woods, on sandy soils. 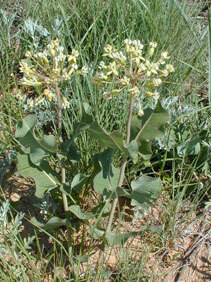 Comments: Formerly treated as Asclepiadaceae - Milkweed Family.